In 1942, Sendy Togo and his two accomplices travelled from their home town of South Grafton to Sydney in order to complete their enlistment in the second A.I.F. Having already passed preliminary tests at the country centre in Murwillumbah, the men were keen to fight for their country. How shocked they were to receive the news that their willing service was neither necessary nor desirable. Here we have the curious case of the army who in the middle of a war refused fresh recruits. Sendy certainly could see no sense in the situation; “I am anxious to serve Australia but, without any examination or explanation I am being sent back”. But you see, Sendy and his friends were Aboriginal men. For this reasons alone they had to fight for the right to die for one’s country. This was just the start of the complex and remarkable nature of Indigenous war service to Australia. Above: Sendy Togo extracted from Aborigine Sent Home By Army,” Sunday Sun, January 4, 1942. The rights of an Indigenous Australian during World War Two (WWII) were seriously restricted. Not even being recognised as part of the nation makes the stream of volunteers from Aboriginal communities a riveting event to research. The lack of rights however was recognised and raised as a concern for Aboriginal enlistment. Rather prominent members of the community such as William Cooper were pushing for citizenship rights before enlistment. Cooper summed up the situation “He (Aboriginal men) has no country and nothing to fight for but the privilege of defending the land which was taken from him by the white race without compensation or even kindness.” This is not to mention the treatment of Aboriginal veterans from World War One (WWI) who were not even allowed to be served a drink in a pub. Despite this, Aboriginal Australians supported the involvement of Australia in the war itself. In fact the Australian Aborigines League was one of the first to condemn German persecution of Jews during Kristallnacht. But contending with the lack of citizenship was not the only obstacle to overcome. For example the military issued orders officially rejecting the service of capable, able-bodied Aboriginal men and women! Although exempt from conscription the Defence Act outlined that those who were British subjects could freely volunteer. In fact the Australian Military, Regulations and Orders no.177 made during WWI provided the only restriction of enlistment based on race which required an enlistee have one parent of European origin. As an army order it did not have the legal ground of the Defence Act. So from these origins the grounds for restricting Aboriginal enlistment remained shaky In May 1940 a memo on the official military stance on the racial makeup of the army was posted. Enlistment of non-Europeans and aliens was “neither necessary not desirable.” White Australia claimed itself as the sole defender of the country. The bombing of Darwin on the 19th of February 1942 however, signified that war was knocking at Australia’s front door and it was not the time to be saying ‘no’ to able volunteers. Cracks appeared in the practice of the 1940 declaration which claimed that Aboriginal volunteers were not necessary or desirable. 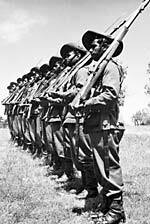 Aboriginal enlistment peaked between 1942 and 1943. Officials grappled with the value of aboriginal service verse their prejudices towards their aboriginality. For example in a letter to the Western Mail in 1941 a soldier outlined what he considers to be the foolishness of removing a capable Aboriginal soldier Jack Blurton. Blurton was told to leave the training camp Blackboy Hill Camp (along with all other men enlisted with Aboriginal descent) after an Aboriginal man returned to the camp with an unspecified disease and fears were sparked about having Aboriginal men in the army. The writer of the letter notes that there could be “no finer Australian enlisted”. Though records of race were not kept for enlisted soldiers and thus we can only estimate the extent of Aboriginal and Torres Strait islander participation at 3000 serving in the official forces whilst another 3000 worked as civilian labourers (Robert Hall, 1992). When considering the percentages, the scale as well as the battle to even enlist is impressive. Torres Strait Islanders represented the largest group from a single population in Australia to serve, even more than white Australians. The official stance against enlistment by Aboriginal people however, silenced this history until well after the granting of citizenship rights in 1967. At the outbreak of World War Two Indigenous Australians had a number of options with which they could proceed. Although the challenge of a lack of citizenship rights was legitimately presented, the enthusiasm to serve was not diverted despite official orders restricting the racial makeup of the Australian forces. The desire of Aboriginal Australians to serve far outweighed the attempts of the army to create barriers to service. The conflicting needs of the military too ultimately allowed volunteers to slip through the cracks and prove that the digger legend also includes Aboriginal Australians. Hall, Robert. “Aborigines, the Army and the Second World War in Northern Australia.” Aboriginal History 4 (1980): pp.73-96. Hall, Robert. “Finding the Black Parts of the Digger Legend: A Guide to Archival Sources on the Aboriginal and Islander Contribution to the Second World War.” Aboriginal History. 16 (1992): pp.58-72. Cooper to the Minister for the Interior AA. 3 January 1939. A659, 40/11858 Australian Archives. War Cabinet Agendum, 24 February 1940, NAA: A2671, 45/1940, National Archives of Australia, Canberra. “Indigenous Australian Servicemen.” Australian War Memorial. https://www.awm.gov.au/encyclopedia/aborigines/indigenous/. The Argus. “Deputation Not Admitted.” December 7, 1938. Sunday Sun. “Aborigine Sent Home By Army.” January 4, 1942. Western Mail. “Something Wrong Somewhere.” March 27, 1941. This entry was posted in Uncategorized and tagged Australian history. ← The Black Chartist – Unlikely Hero’s In Our National Narrative. Interesting piece Cassandra. I was surprised to learn that a higher percentage of Torres Strait Islanders served than any other racial group in Australia, including white Australians. I would be interested to learn about where they served and their exploits. Do you mention this in your capstone essay? Thank your for your question. I am glad you enjoyed reading the article. I do mention the experience of Torres Strait Islander service in my research essay. An example is the Northern Territory Special Reconnaissance Unit formed by the anthropologist Donald Thomson consisted of volunteers from the Yolngu tribe. The unit was raised to provide a coast watching service along with the potential to be used as a guerilla warfare force. The Torres Strait was strategically significant to the war effort and was at risk from a Japanese Invasion. This may explain why such a high number of the population served. In terms of Aboriginal service, they served in all fronts and sections of the military. There was a particularly large number serving the Royal Australian Air Force due the commitment of the Empire Air Training Scheme under which Australia supplied 27,000 pilots to Britain. The RAAF was willing to turn a very blind eye to Aboriginal enlistment as they really needed the man power!